Now, now queens. If there’s anything we know, it’s that a party dedicated to Peaches is sure to be a lot more than your average night out. And so, for the upcoming Shake Yer Dix: Peaches Spexxxial we are pulling out all the punches. 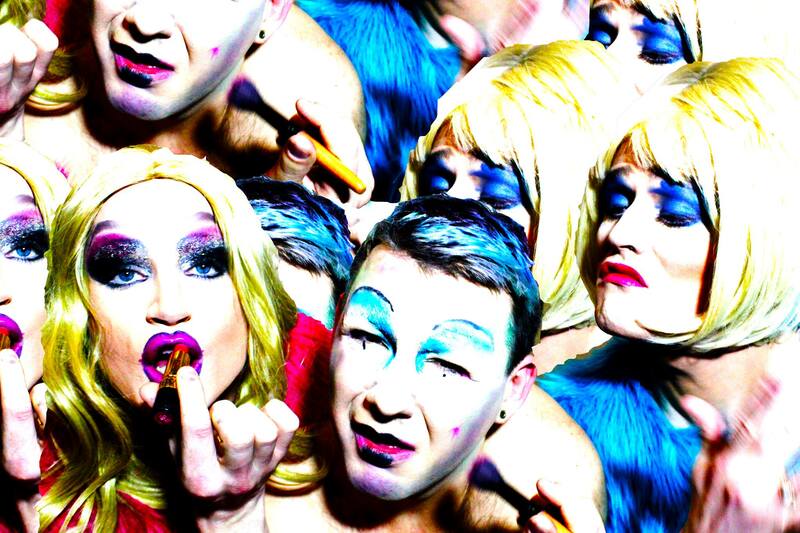 We are thrilled to welcome South East London’s queer-postmodern-gender-twisting-category-defying-glitter-encrusted drag troupe extraordinaires, The Shift! We caught up with the fabulous Josh to chat trailer parks, the Spice Girls and, of course, Peaches! Hi! Can you introduce us to The Shift in a few sentences? Hi Babes! Thanks for having us! Full of wit, panache and fizzy pop, The Shift creates an experimentally safe & open environment to infuse our Pop Performance Party Philosophy. We love sticky pop culture but also are keen to critique it at the same time. Simples. There is a crazy-eclectic mix of characters in The Shift. How did you all come together? I know a bunch of artists from all sorts of weird and wonderful places and when The Shift came together I individually singled them out, got them drunk and asked them if they would carry on doing what amazing work they do but just add a bit more sequin or a Paks wig to their proceedings and get on a stage in the back of a South East London pub. We are very intrigued by your name! Are we talking cultural shift, gear shift, or just shifty behaviour in general? So the name came from us wanting a night that was different from the burlesque, acoustic open mic & stand up nights that kept rotating round the local circuit. We wanted to SHIFT (pun intended) the idea of what pub performance could be and give people something different. We want, and still want to create safe spaces for people in the back of SE London pubs and elsewhere, shifting the idea of where you could go, what you can see and who you can meet on a Friday night. This edition of Shake Yer Dix is dedicated to political punk dancefloor warrior queen, Peaches. What do you love about her? There seems to be a really exciting collision happening at the moment between club nights and performance art – where do you think this has come from? There has always been a tight relationship between music, visual art, performance & fashion and its existence in nightlife. It seems that when people are completely dissatisfied with the powers that be, DIY art flourishes and comes together and manifests in the sweaty darkness of pubs & clubs. You have worked with artists from a variety of disciplines, and performed in quite a variety of spaces. What has been the highlight for you? The highlight was filming in a trailer park in Hampstead Heath. I had got together a bunch of friends and performers for this mad idea I had to emulate a Beyonce music video. We turned up, partied, danced & had a great time, much to the dismay of the park inhabitants. It wasn’t meant to be a performance as such but those accidental spaces are definitely better than any stage. If you had a time machine could perform in any space anywhere/anywhen, where would you perform? Would there be any special guests? Events like the fall of the Berlin wall, or at the Stonewall Inn or even Studio 54 spring to mind but if it could only be one moment It has to be Spice Girls performing Wannabe at the ’97 Brit awards. And obviously we would be the special guests. What does your perfect queer utopia look like? Jack Halberstam is taught in school, Peaches is lord, pound shops reign supreme, glitter on tap, Katie Hopkins is gagged & Daily Mail becomes an ancient text of which we never speak of. Can you give us a sneaky idea of what you have in store for us at Shake Yer Dix? Well! Recently being on our travels just like Dorothy on the Yellow Brick Road, we have managed to pick up outlaws from everywhere and anywhere – from Latitude Festival, Edinburgh Fringe & The Valleys in Wales. So I’m not even sure what you can expect! What I do know, though, is you can expect more for your sweet tooth than humanly possible & so much aggressive glamour. Catch The Shift at the Shake Yer Dix: Peaches Spexxxial on Friday 18 September from 9pm-3am.